CLASS 4B IS OUT OF SCHOOL, OFF TO THE WOODS, AND INTO A LOT OF TROUBLE! It's Outdoor Education at Camp Trotter -- the last place Hobie Hanson wants to be! Just the idea of leaving home gives him woolly worms in his stomach. 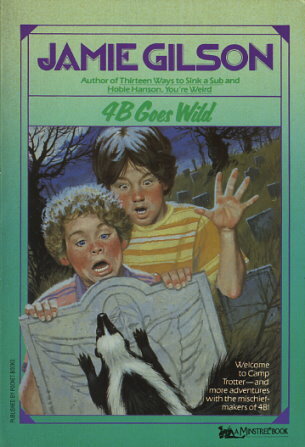 But once 4B is set loose in the woods, Hobie's got more than his share of thrills and chills...spine-shivering ghost stories, midnight meetings in a graveyard, and even a run-in with a very angry skunk! 4B is having a wild and crazy time -- and Camp Trotter may never be the same!